Clamp Tite Drill Stops are the perfect way to control drilling depth. Unlike stop collars that use a single set screw, the split collar design applies tight, even pressure around the perimeter of the bit. Because of this, it resists loosening and shifting, which can mar the drill bit and unexpectedly change drilling depth. Use a 7/64" Allen wrench to tighten and loosen the drill stop. The split collar design helps prevent slippage. Not difficult to use and stays put with little effort. The best stop collar that I have used. works correctly , and maintains its position on the drill shaft well. This product has saved me a lot of time especially setting up for dowel pin installation--keeping the correct alignment. I often drill too deep so this is a good tool for me and you don't have to put tape on it, just screw the clamp and its good. You do have to make sure that it is "Tight" or the collar will slip...wish the allen wrench was included, after some searching I found a 7/64. I would buy again...other size if they were available? Shipping was on time and free as I had this as an add on to another purchase. Solid device, one size. Wish an allen wrench was included, had to find mine. May slip if not tight, maybe need to back it up with tape. I would buy this again. I looked at others, this one seems like the best. Buy something else and save on the shipping charges. Found It Was More of a Hinderance. While trying to drill 2" hole, the stop became more of a hinderance. It did not allow enough of the sank of the forester bit to remain in the chuck of the drill. The bit seized as the drill chuck spun around it, marring the surface of the shank on the Forstner bit. This made it also impossible to remove the bit from the Jig-It drill guide. A hammer was needed. I removed the stop which allowed me to move the bit more into the chuck. No problems after that. The drill chuck became to the top. I purchased these and first attempt to use failed. I found the appropriate stop (came in a set of 3 or 4), went to tighten around the drill. hard time to get it to stay in place on the drill and when I went to tighten the allen screw, the collar cracked on the "hinge" side opposite the allen screw. I get that this device needs to be a little flexible but the metal snapped as I tightened. Hope the remaining stops hold up - time will tell. By adding a piece of tape to the inside, I get good grip and bit protection that is better than other drill stops. Seems more effective than tape to make the stop. 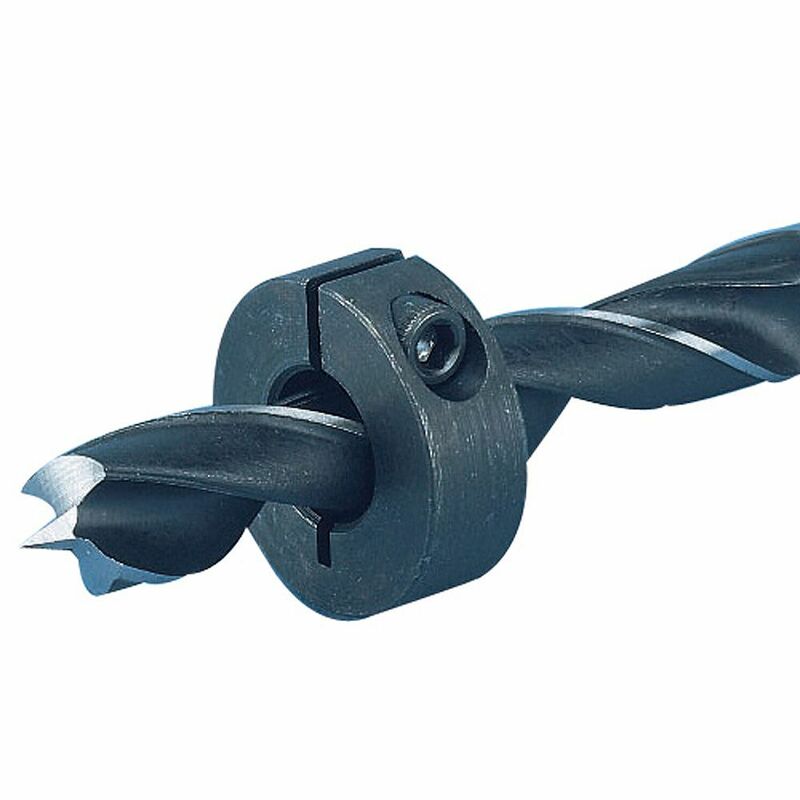 Sometimes I only want to drill a hole to a certain depth and instead of just using a piece of tape on the drill bit to make sure I don't drill to deep this Item looked like it would help to make sure that the holes I drilled were of a more uniform depth. Always good to have a collar stop. A useful gadget to have at hand. So I can use the long shank Forstner bit with the JIG IT Drill guide without worrying about depth. I think this is a great idea and I will use it too. Better grip on the drill bit than a set screw. 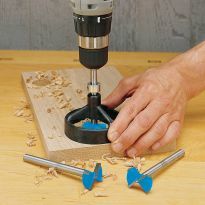 For use with Rockler JIG IT Drill Guide System. Rockler recommends it when using their JIG IT drill guide. Keep looking for a stop that works, maybe this'll be the one. Have another on a dedicated drill. Needed an extra! Perfect for setting bit depth. Yeah, I needed these so that when I do brain surgery on my brother my cordless drill won't go in too far and take out the pituitary gland, or damage the sella tursica. It could also help stop the bleeding, and spinal fluid leaking from the dura mater. I had a lot of holes to drill all had to be the same depth and I did not have a bench press. Good for limiting drill hole length although it is hard to find the needed hex wrench. Needed a collar type drill gauge for any purpose. Needed it for use on the item below. Need a better 'stop' than what I have.